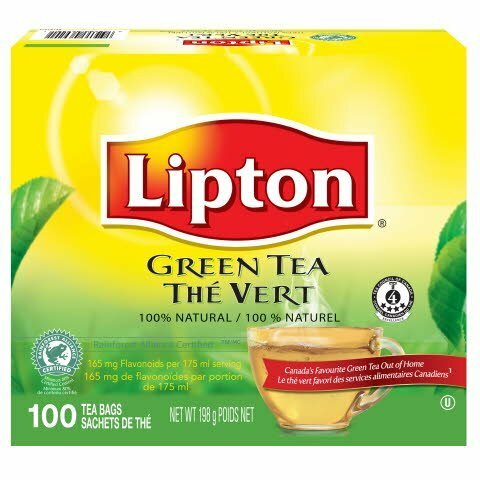 100% natural, Rainforest Alliance Certified™ green tea. Our Master Blenders created this great tasting blend starting with freshly picked, high-quality tea leaves which delivers an exceptionally pure tea flavour and aroma. Packaged in a zero-landfill facility. 5/100 count. Brought to you by Lipton®. For a delicious cup of hot green tea, put one tea bag per serving into a warm pot. Pour in 250ml of fresh, boiling water, and let steep for 1-1½ minutes. Sweeten to taste. One bag per cup. Optimum temperature tasting is 60 - 70 degrees C.